Frozen fans will be ecstatic with the way Disney has re-imagined its much-loved blockbuster film for the stage, now that the doors to Frozen – Live at the Hyperion are open on the Hollywood backlot of Disney California Adventure. 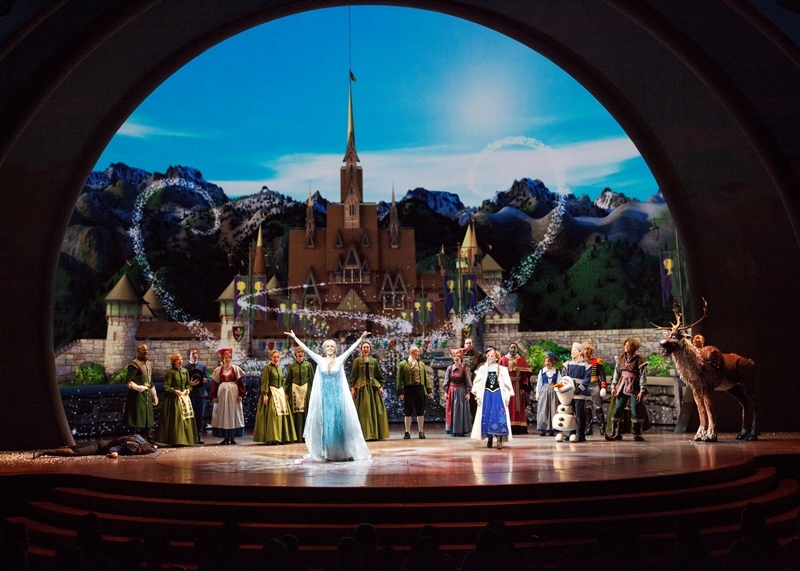 And with its stunning state-of-the-art visual technology and heart-opening theatricality, it’s safe to say that even Uncle Walt would be proud of his studio’s latest creation. 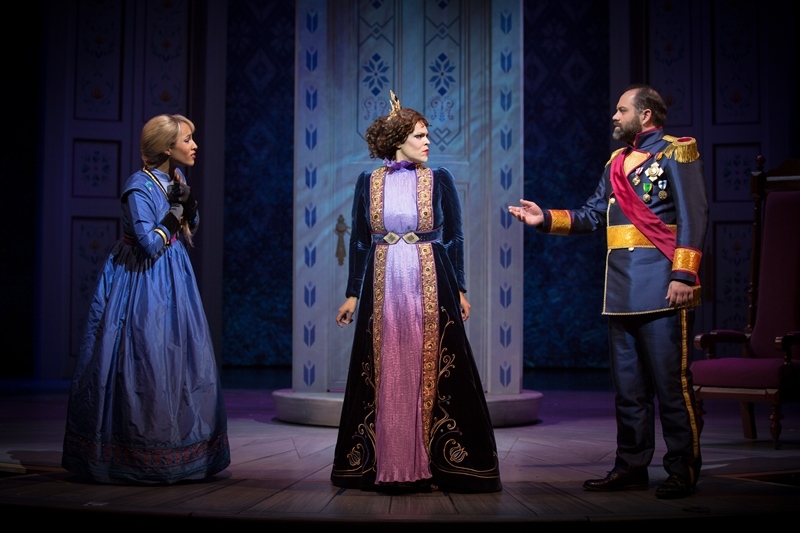 This idea of openings is woven throughout the show (both in design and story) by director Liesl Tommy, choreographer Christopher Windom, and the creative team who have carefully crafted every detail of Elsa and Anna’s journey. Enormous panoramic scenic views are created on more than 20 different video surfaces, including a custom curved 2,200 square-foot LED wall on stage and an aurora borealis-inspired curtain so massive it almost completely surrounds the audience. Moving animations breathe life into the space while taking the audience out over the snow-capped mountains and into the mythical kingdom of Arendelle in astonishing detail. Seating capacity in the Hyperion is nearly 2000 so you can imagine the hours that have gone into creating the show’s large effects. The one hour and forty-two minute film has been adapted to run under an hour and does so succinctly and quite seamlessly. 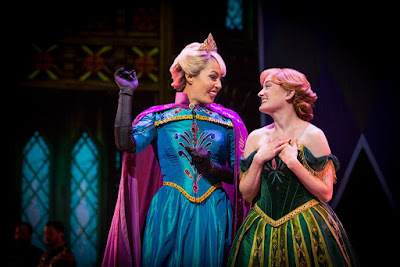 All of the beloved characters and iconic images have been beautifully realized in their live form, from Anna and her quirky way of putting her foot in her mouth, to Elsa and her shimmering blue gown and icy palace, to Olaf’s dreamy vision of summer, to the playfulness of the rock trolls. 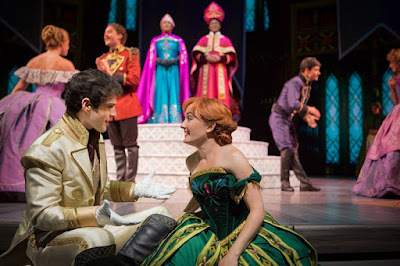 The cast is terrific and endlessly enchanting. Suffice it to say there are no unmet expectations in this engaging experience. 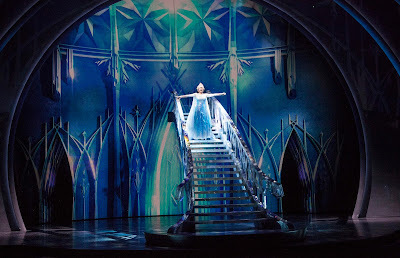 Elsa delivers her iconic “Let It Go” number in a breathtaking sequence atop a magnificent ice staircase that revolves out over the audience and Anna and Kristoff’s escape from the wolves ends with an aerial drop that is both thrilling and humorous. Even the villain reveal is executed with an element of surprise that is sure to bring gasps from subsequent audiences just like it did on opening night. 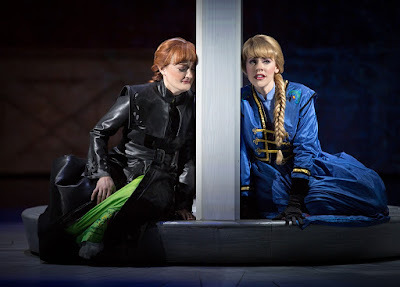 But for all its spectacle and drama, the show never loses sight of the fact that, at its core, it is a story about two sisters and the love they share. It is their longing to connect that tugs at our heartstrings and touches a universal cord in us all. Jason Michael Webb has adapted and arranged the movie’s best songs for a cast of 24 from a total of 107 actors who will perform on a rotating schedule. Those songs, so familiar in the animated version, now come to life with even more personality under musical director John Glaudini’s supervision. “Let It Go” may be the most famous of them all but “Love is an Open Door” is the one you’ll walk out singing. Anna’s “Do You Want to Build a Snowman” and Olaf’s “In Summer” are full of fun, and the choral chanting in “Vuelie” is simply gorgeous. 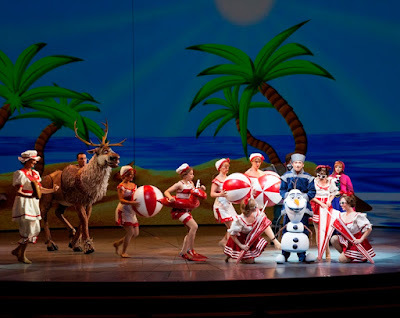 The adorable puppets – including Sven, the reindeer, and snowman Olaf – by Michael Curry (who worked with Julie Taymor on The Lion King) are beyond charming, and the show contains more than 1000 brilliantly colored fanciful costumes by Clint Ramos. Even the detail work on the show’s massive doors is authentic, painted in a Norwegian style of folk art called rosemaling. Welcome to the richly complete world of Arendelle. 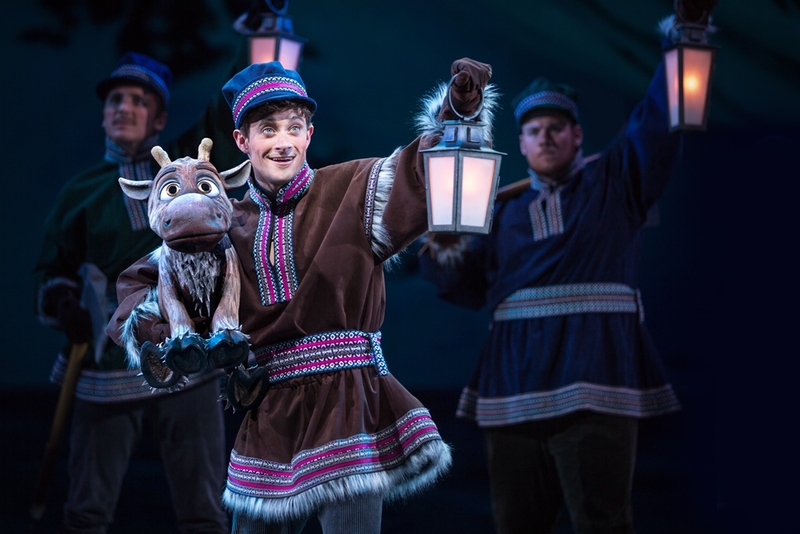 With Frozen – Live at the Hyperion, Disney has created a timeless theatrical experience that artfully captures the story’s emotional heart. 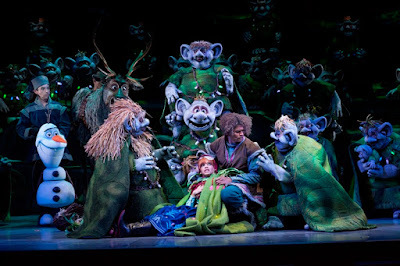 Full of whimsy, sweet “aww” moments, dancing, drama, and incredible effects and animations, I can’t recommend it highly enough. 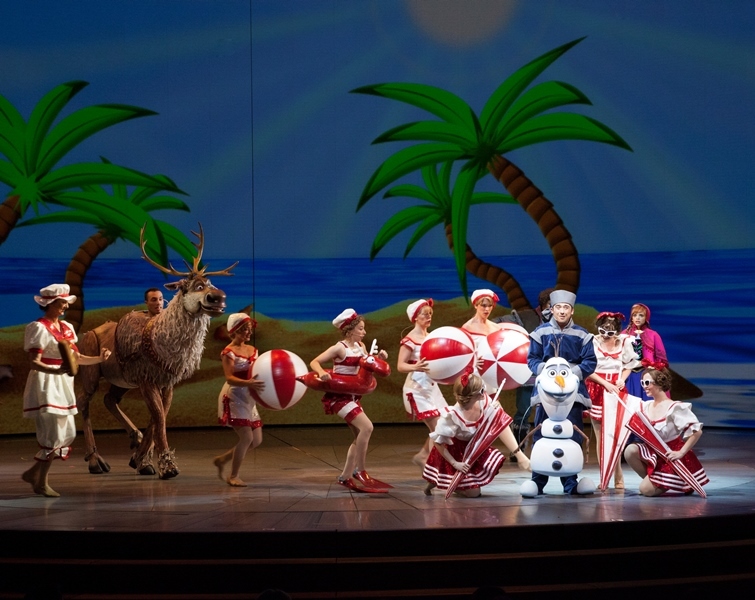 And since Frozen doesn’t arrive on Broadway until 2018, those looking to ‘let it go’ will do best to head west.